Anthony Davis erupts for 33 points and 14 rebounds as the Pelicans take down the Pistons 109-86. Louis Williams scores 27 points as the Rockets defeat the Pelicans, 129-99. Donatas Motiejunas dishes to Dante Cunningham who hits the jumper while drawing the foul. Kentavious Caldwell-Pope scores a career-high 38 points with four steals and four rebounds as Detroit wins it 118-98. Klay Thompson leads the Warriors with 27 points on the way to a 114-81 win over Houston to advance to the Conference Semifinals. Patrick Beverley finds Donatas Motejunas open for three and he buries it. Klay Thompson heats up 23 points with 5 assists as the Warriors cruise past the Rockets in Game 4, 121-94. 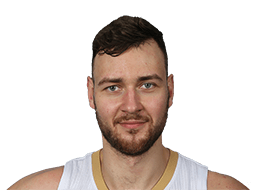 Donatas Motiejunas drives in for the nice one-hand jam. James Harden scores 35 points with a game-winning shot as the Rockets beat the Warriors in Game 3, 97-96. Klay Thompson scores 34 points and Draymond Green adds 12 points and 14 rebounds as the Warriors beat the Rockets 115-106. James Harden finds Dwight Howard for the alley-oop dunk. Donatas Motiejunas tips in the offensive rebound and draws the foul to complete the three-point play. James Harden goes off for 38 points and 4 rebounds as the Rockets beat the Kings 116-81. Dwight Howard gets the steal and finds James Harden who gets it to Donatas Motiejunas for the fast break bucket. Donatas Motiejunas drives and makes the no-look dump off to Dwight Howard for two inside. Dwight Howard catches the lob from Donatas Motiejunas and finishes at the rim. James Harden goes off for 27 points as the Rockets beat the Cavaliers 106-100. Gordon Hayward heats up for 22 points with 6 rebounds as the Jazz edge past the Rockets 89-87. Russell Westbrook goes off for 21 points, 15 assists, and 13 rebounds as the Thunder beat the Rockets 111-107. Netted 12 points on 5-of-6 shooting vs. Denver (11/16/13) … notched a career-high three blocked shots vs. Memphis (12/26/13) … posted six points (2-7 FG), five rebounds and one block in just 10:23 off the bench in a 113-99 win vs. the L.A. Lakers (1/8/14) … collected 10 points (4-7 FG), five rebounds and one block in a 103-100 win at New Orleans (1/15/14) … came off the bench with 15 points (6-9 FG) and seven boards vs. Oklahoma City (1/16/14), which included a careerhigh three 3-pointers made (3-4 3FG) … made his first start of the season replacing an injured Terrence Jones (deep left thigh bruise) vs. Portland (1/20/14), pulling down nine rebounds to go with nine points (4- 8 FG) … made another start at power forward and grabbed nine more boards vs. Sacramento (1/22/14) … matched his career high of two steals (4/1/13 vs. Orlando) vs. Milwaukee (1/18/14) and vs. Memphis (1/24/14) … posted the first double-double of his career with 12 points (4-5 FG, 4-6 FT) and 13 rebounds in a 117-115 win at Dallas (1/29/14) … totaled 12 points (5-11 FG, 2-4 3FG), five boards, two steals and one block in a 134-108 win at the L.A. Lakers (2/19/14) … posted seven points (3-7 FG), 11 boards, three assists, two steals and one block in a 124-86 win vs. Utah (3/17/14) … marked his second double-figure rebounding game of 2013-14 … scored a career-high 20 points (9-11 FG) to go with six rebounds in a 129-106 win vs. Minnesota (3/20/14), surpassing a 19-point effort vs. Phoenix (3/13/13) … went a perfect 5- of-5 shooting (1-1 FT) for 11 points at Cleveland (3/22/14), converting 10 consecutive field goal attempts after having made his final five shots vs. Minnesota (3/20/14) … also started for Jones (flu-like symptoms) at Brooklyn (4/1/14) … posted 13 points (5-11 FG, 3-5 FT) along with a season- and career-high 15 rebounds at the L.A. Lakers (4/8/14) … grabbed 10 rebounds and scored 11 points (3-9 FG, 1-1 3FG, 4-4 FT) at New Orleans (4/16/14) … marked his third double-double of his career. 2012-2013: In his rookie season with Houston, averaged 5.7 points and 2.1 rebounds in 44 games (14 starts) … was a DNP (CD) for 26 games (10/31/12-11/9/12; 11/12/12; 12/1/12-12/4/12; 12/8/12-12/12/12; 12/26/12-12/28/12; 1/2/13; 1/5/13; 1/9/13; 1/12/13; 1/16/13; 1/19/13- 1/21/13; 1/30/13-2/2/13; 2/6/13; 2/10/13-2/12/13; 4/17/13) … placed on the inactive list for 12 games (11/14/12-11/23/12; 12/14/12-12/17/12; 1/23/13- 1/26/13) … made his NBA debut with three points (1-1 FG) vs. Detroit (11/10/12) … assigned to Houston’s single-affiliation NBA D-League partner Rio Grande Valley on Nov. 13 … recalled from the Vipers on Nov. 25 … re-assigned to Rio Grande Valley on Dec. 14 and recalled on Dec. 18 … re-assigned to the Vipers on Jan. 22 and recalled on Jan. 28 … averaged 20.3 points, 9.7 rebounds and 3.0 assists in seven games (seven starts) with Rio Grande Valley … totaled 13 points (5-8 FG, 3-4 FT) at the L.A. Clippers (2/13/13) … registered his first career start vs. Milwaukee (2/27/13), scoring 13 points (4-9 FG, 4-4 FT) to go along with seven boards and a career-best five assists … netted 17 points (7-12 FG, 2-5 3FG) at Orlando (3/1/13) … grabbed a career-best eight rebounds vs. Dallas (3/3/13) … led the Rockets with a career-high 19 points (7-12 FG, 2-4 3FG, 3-4 FT), five rebounds, two assists and one block in a 111-81 win vs. Phoenix (3/13/13) … recorded a team-high-tying 16 points (7-11 FG, 2-3 3FG) at Memphis (3/29/13) … collected 11 points (4-11 FG, 3-4 FT), a career-high two steals and one block in 33:38 of action vs. Orlando (4/1/13) … averaged 16.3 points and 7.8 rebounds in four games (four starts) with the Rockets during the 2012 NBA Summer League in Las Vegas, earning NBA Summer League 2012 All-Star honors. An early entry candidate, selected by Minnesota in the first round (20th overall) in the 2011 NBA Draft … Houston acquired his draft rights from the Timberwolves along with Jonny Flynn and Minnesota’s 2012 second-round selection in exchange for Brad Miller, the rights to Nikola Mirotic (23rd overall pick), a future first-round pick and cash considerations on June 23, 2011 … signed a multi-year contract with the Rockets on July 6, 2012. National Team competition … honors included MVP of the 2008 Nike International Junior Tournament and MVP of the 2008 U-18 European Championship … member of the World Select Team at the 2009 Nike Hoop Summit.